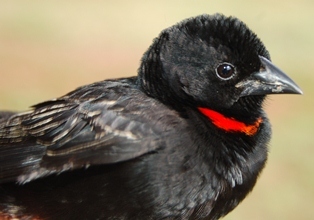 The Red-collared Widowbird was formally named by Pieter Boddaert, a Dutch naturalist, in 1783. The background comments about Boddaert and the Count of Buffon are the same as listed under the Long-tailed Widowbird. Boddaert published the first Linnean binomial names (scientific names) for the Red-collared Widowbird. This species was illustrated in Edme-Louis Daubenton's book of illustrations - the coloured engravings by Francois-Nicolas Martinet were published in 1783 as Planches enluminees. 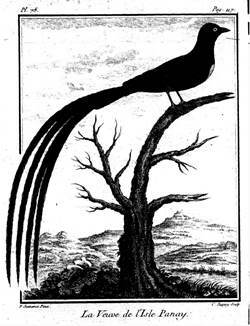 But Buffon had also published an earlier version with a limited number of species in a book of plates in 1770, and the only weaver to feature here was the Red-collared Widowbird. The 1770 painting may have been painted by Martinet, but is different to the later version in 1783. Both paintings, however, show a red circle on the breast of the male widowbird instead of a collar. This may be due to the breast feathers being damaged between collection and arrival in Paris. Boddaert and Buffon gave this species the French name Veuve en feu, ie. burning widow, referring to the bright red breast colour in contrast to the rest of the black plumage. Boddaert also gave the scientific name based on the bright red on the breast of the male. Buffon noted that the bird originated from Cap de Bonne Esperance & a I'ile Panay, ie the Cape of Good Hope and Panay island in the Philippines. This was based on one of Buffon's many correspondents, Pierre Sonnerat. Sonnerat made several voyages to southeast Asia, visiting the Philippines and Moluccas between 1769 and 1772. 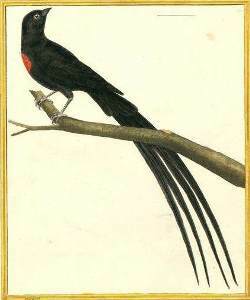 He must have collected the Red-collared Widowbird in 1769 (or 1770) in South Africa en route from the Philippines to France, where Buffon illustrated it in 1770. 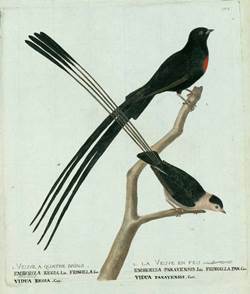 Sonnerat published his travel diary in 1776 and also listed this widowbird from "Cap de Bonne Esperance & a I'ile Panay". Why he listed Panay Island is not clear. The Cape of Good Hope could mean the Cape in its broadest sense, ie either the Western or Eastern Cape. 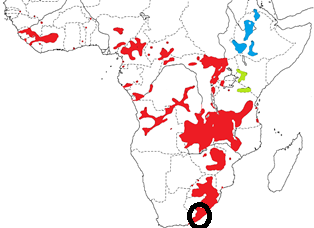 Mackworth-Praed & Grant 1955 restricted the locality to the Eastern Cape, as the Red-collared Widowbird does not occur in the Western Cape. Buffon had many correspondents who sent him specimens from different places in the world, but no details are published for the Red-collared Widowbird as to who collected this species. Fringilla ardens	Boddaert 1783	Tabl. Planch. Enlum., p39	Cape of Good Hope, S Africa (ex Daubenton, Planch. Enlum., pl 647). Restricetd to E Cape. ardens (Latin) = glowing, burning (ardere, to burn). The Fire-coloured Widow (Buffon 1793). Black Widowbird, Cut-throat Widow-bird, Flaming Whydah, Red-Hooded Whydah, Red-naped Widowbird. Between 1769-1770, when Sonnerat visited the Philippines (and before the publication of Buffon's 1770 colour engraving of the species). No type specimens known to survive, but the painting of Buffon serves as a type. Identification. 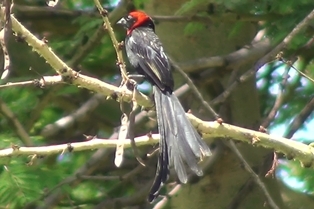 The adult male Red-collared Widowbird Euplectes ardens in breeding plumage (above left) is black, often with a red collar or head, and a long tail. 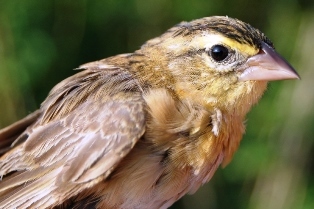 Females (below) and non-breeding males are dull coloured, with a yellowish eye-stripe and yellowish or buffy breast sharply demarcated from the white belly. E.a. suahelicus, found in the highlands of Kenya and N Tanzania (green on map); the male has a red collar, and varying amount of red on the head (above right). The highland laticauda and suahelicus are isolated from the Iowland birds and from each other, and may be separate species. Molecular studies indicate that the Red-collared Widowbird is a bishop with a long tail, rather than a widow. Habitat. It occurs in a variety of habitats including grassland, rank vegetation, cultivated areas, and slopes with sparse trees. Food. The Red-collared Widowbird feeds on seeds, insects including termites, nectar. It forages on the ground, often in flocks of 200 birds or more. Breeding. This species is polygynous and territorial. Males with longer tails attract more females and males with larger red collars held larger territories. Males prefer hillsides, where they can glide downhillfor display flights. The nest is an oval structure with a side entrance, built by the male and lined and strengthened by the female. A male may have 3-22 nest structures placed in tall grass, on his territory. The eggs are grey or blue-green and heavily speckled with brown, often forming ring near the thick end (see photo at phown 2411).